Stamped white pigskin with metal corners and clasps. Private collection, Switzerland; London, Sotheby's, June 4, 1934, lot 33; purchased in Dec. 1951 from William H. Schab, New York for William S. Glazier (1907-1962), New York; deposited by the Trustees of the William S. Glazier Collection in 1963. 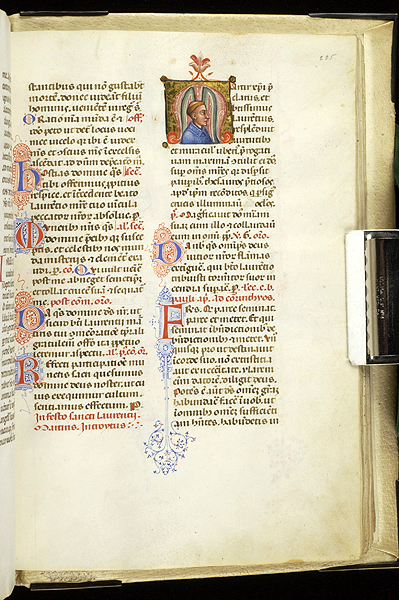 Missal for the use of Rome; written and illuminated in Italy, perhaps in Teramo or Bologna, between 1375 and 1399? or during the second half of 14th century? Decoration: 18 large miniatures, 28 small miniatures, 102 historiated initials, mostly heads or busts; the small miniatures form a series that illustrates the gestures and rituals of clerics during the celebration of the Mass.